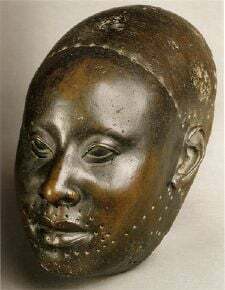 Yoruba bronze head sculpture, Ife, Nigeria c. twelfth century C.E. The arts of Africa constitute one of the most diverse legacies on earth. While many observers tend to generalize "traditional" African art, the continent is full of peoples, societies, and civilizations, each with a unique visual culture. From c. 6000 B.C.E., rock drawings in Africa have included representations of animals and hunters. 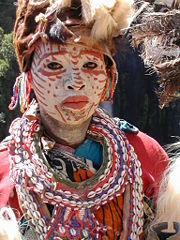 From the beginning of tribal differentiation, tribal art has become a way of isolating one tribe from another, and tribal art can take the form of scarification, (to create a design on the skin by means of shallow cuts that are sometimes rubbed with a colorant or irritant to enhance the resulting scar tissue), body painting, or sculptural masks used in religious ceremonies. Diversity also appears in separate geographical regions, where natural resources controlled the materials used, while tribal power, wealth, or sophistication was responsible for the type of objects produced. Often, African art production has been related to ritual or tribal ceremonies, as well as serving more secular decorative functions. However, it is not always easy to determine the function of a particular work. In many tribes, the artist had a high status, but the artist would not necessarily have been the equivalent of the western fine artist who relied on patronage or the marketplace to regulate their production. In the nineteenth and twentieth centuries, European colonizers "discovered" African art and it was embraced by Modernist artists for its lack of pretension and exciting formal qualities. With the Westernization of much of African society, "traditional" art became commercialized and sold as souvenirs. While from the 1920s, the growth of African art colleges in more modernized sections of Africa has led a number of African artists to adopt Western influences in their work. At the same time, more-established African artists have seen the sale price of their work increase as it became the object of serious artistic consideration. 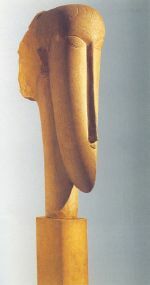 Nigeian Nok sculpture, c. 500 B.C.E. The origins of African art lie long before recorded history. African rock art in the Sahara in present day Niger preserves 6000-year-old carvings. 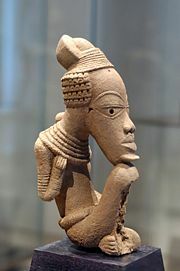 The earliest known sculptures are from the Nok culture of Nigeria, made around 500 B.C.E.. Along with sub-Saharan Africa, the cultural arts of the western tribes, ancient Egyptian artifacts, and indigenous southern crafts also contributed greatly to African art. Often depicting the abundance of surrounding nature, the art was often abstract interpretations of animals, plant life, or natural designs and shapes. More complex methods of producing art were developed in sub-Saharan Africa around the tenth century, some of the most notable advancements include the bronze work of Igbo Ukwu and the terracotta and metalworks of Ile ife bronze and brass castings. Despite this diversity, there are some unifying artistic themes when considering the totality of visual culture from the continent of Africa. The human figure is the primary subject matter for most African art. In historical periods involving trade between Africa and Europe, the introduction of the human body into existing European pottery and other art forms can reliably be taken as evidence of contact with African cultures. For example, in the fifteenth-century Portugal traded with the Sapi culture near the Ivory Coast in West Africa, who created elaborate ivory saltcellars that were hybrids of African and European designs, most notably with the addition of the human figure. African artworks tend to favor visual abstraction over naturalistic representation. This is because many African artworks, regardless of medium, tend to represent objects or ideas rather than depict them. Even the so-called portrait heads of Ile-Ife in modern-day Nigeria, usually thought of as naturalistic representations of rulers, have actually been smoothed and simplified in an effort to abstract and generalize stylistic norms. 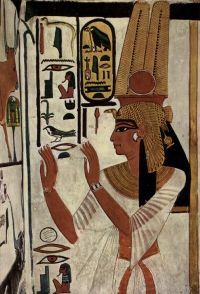 Ancient Egyptian art, also usually thought of as naturalistically depictive, makes use of highly abstracted and regimented visual traditions, especially in painting, as well as the use of different colors to represent the qualities and characteristics of an individual being depicted. African artists tend to favor three-dimensional artworks over two-dimensional works. Even many African paintings or cloth works were meant to be experienced three-dimensionally. House paintings are often seen as a continuous design wrapped around a house, forcing the viewer to walk around the work to experience it fully; while decorated cloths are worn as decorative or ceremonial garments, transforming the wearer into a living sculpture. An extension of the utilitarianism and three-dimensionality of traditional African art is the fact that much of it is crafted for use in performance contexts, rather than in static ones. For example, masks and costumes very often are used in communal, ceremonial contexts, where they are "danced." Most societies in Africa have names for their masks, but this single name incorporates not only the sculpture, but also the meanings of the mask, the dance associated with it, and the spirits that reside within. In African thought, the three cannot be differentiated. Wooden masks, which might represent either human or animal, are one of the most commonly found forms of art in western Africa. In their original contexts, ceremonial masks are used for celebrations, initiations, crop harvesting, and war preparation. The masks are worn by a chosen or initiated dancer. During the mask ceremony the dancer often goes into a deep trance, and during this state of mind he "communicates" with his ancestors. The masks can be worn in three different ways: vertically covering the face; as helmets encasing the entire head; and as crests resting upon the head, which was commonly covered by material as part of a disguise. African masks often represent a spirit, and it was strongly believed that the spirit of the ancestors or the deity possesses the wearer. Most African masks are made with wood, and can be decorated with a number of substances including: ivory, animal hair, plant fibers (such as raffia), pigments, stones, and semi-precious gems. Statues, usually of wood or ivory, are often inlaid with cowrie shells, metal studs, and nails. Decorative clothing is also commonplace and comprises another large part of African art. Among the most complex of African textiles is the colorful, strip-woven Kente cloth of Ghana. 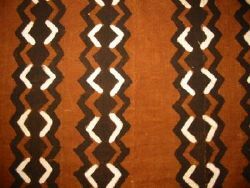 Boldly patterned mudcloth is another well-known example. A complete survey is African art is impossible given the limits of the current article. Several regional examples are described here, and more specific information is available at specific country articles. In the northern part of Botswana, tribal women in the villages of Etsha and Gumare are noted for their skill at crafting baskets from Mokola Palm and local dyes. The baskets are generally woven into three types: large lidded baskets used for storage; large open baskets for carrying objects on the head or for winnowing threshed grain; and smaller plates for winnowing pounded grain. The artistry of these baskets is being steadily enhanced through color use and improved designs as they are increasingly produced for commercial use. The oldest evidence are ancient paintings from both Botswana and South Africa. Depictions of hunting, both animal and human figures, were made by the Khoisan (Bushmen) dating before civilization over 20,000 years old within the Kalahari desert. The Baoulé, the Senoufo and the Dan peoples are skilled at carving wood and each culture produces wooden masks in wide variety. The peoples of the Ivory Coast use masks to represent animals in caricature, to depict deities, or to represent the souls of the departed. As the masks are held to be of great spiritual power, it is considered a taboo for anyone other than specially-trained persons to wear or possess certain masks. These ceremonial masks each are thought to have a soul, or life force, and wearing these masks is thought to transform the wearer into the entity the mask represents. The Ivory Coast also has modern painters and illustrators. Gilbert G. Groud criticizes the ancient beliefs in black magic, as held with the spiritual masks mentioned above, in his illustrated book Magie Noire. The art of the Makonde, an ethnic group in southeast Tanzania and northern Mozambique, is subdivided into different areas. The Makonde are known as master carvers throughout East Africa, and their statuary can be found both in tourist markets and in museums. They traditionally carve household objects, figures, and masks. 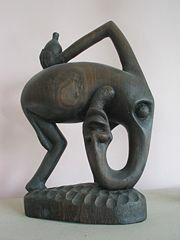 Since the 1950s, the so-called Modern Makonde Art style has developed, with an essential step being the adoption of abstract figures, mostly spirits (Shetani), that play a special role in the genre. The Makonde style is also represented by important contemporary artists of Africa, such as George Lilanga. 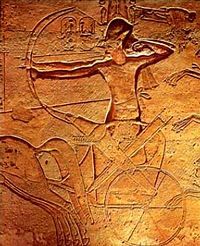 Ramses atop chariot, at the Battle of Kadesh, in a relief inside his Abu Simbel temple. Persisting for 3000 years and 30 dynasties, the "official" art of ancient Egypt was centered on the state religion of the time. The art ranged from stone carvings of both massive statues and small statuettes, to wall art that depicted both history and mythology. In 2600 B.C.E. the maturity of Egyptian carving reached a peak it did not reach again for another 1,500 years during the reign of Rameses II. At the start of the twentieth century, artists like Picasso, Matisse, Vincent van Gogh, Paul Gauguin, and Modigliani became aware of, and inspired by, African art. In a situation where the established avant-garde was straining against the constraints imposed by serving the world of appearances, African Art demonstrated the power of supremely well-organized forms; produced not only by responding to the faculty of sight, but also and often primarily, the faculty of imagination, emotion, and mystical and religious experience. These artists saw in African Art a formal perfection and sophistication unified with phenomenal expressive power. The study of and response to African Art, by artists at the beginning of the twentieth century facilitated an explosion of interest in the abstraction, organization, and reorganization of forms, and the exploration of emotional and psychological areas hitherto unseen in Western Art. By these means, the status of visual art was changed. Art ceased to be merely and primarily aesthetic, but became also a true medium for philosophic and intellectual discourse, and hence more truly and profoundly aesthetic than ever before. Africa is home to a great and thriving contemporary art culture. This has been sadly understudied until recently, due to scholars' and art collectors' emphasis on traditional art. Notable modern artists include Zerihun Yetmgeta, Olu Oguibe, Lubaina Himid, and Bill Bidjocka. Art biennials are held in Dakar, Senegal, and Johannesburg, South Africa. Many contemporary African artists are represented in museum collections, and their art may sell for high prices at art auctions. Despite this, many contemporary African artists tend to have difficult times finding a market for their work. Many contemporary African arts borrow heavily from traditional predecessors. Exhibition of Contemporary African Art was pioneered by the October Gallery in London and many famous collectors, like Jean Pigozzi and Gianni Baiocchi in Rome, who taught other art collectors like Olivier Doria d'Angri the secrets of collecting nice and inexpensive works. Searching for African Art has become a speedy process thanks to the development of computerized search engines. More exposure comes from the trend of sponsoring African art by banks including Deutsche Bank, Merrill Lynch, Goldman Sachs, Barclays, and BNP Paribas. Exhibiting artists at the Venice Biennale, held every calendar year, and Documenta have helped the movement that was ready to benefit from the explosion in art prices at auctions. Modern works are relatively affordable and easy to find. Recently, online-video-game installations have also taken part in the price action. It is not unreasonable to envisage further positive developments thanks to the sponsoring of web sites, Casinos, and listed companies from South Africa, acting as a hub for all the continent's works. African art has a long and surprisingly controversial history. Up until recently, the designation "African" was usually only bestowed on the arts of Black Africa, i.e., the cultures and peoples living in sub-Saharan Africa. The non-black peoples of North Africa, the blacks of the Horn of Africa, as well as the art of Ancient Egypt, generally were not included under the rubric of African art. Recently, however, there has been a movement among African art historians and other scholars to include the visual culture of these areas, since all the cultures that produced them, in fact, are located within the geographic boundaries of the African continent. The reasoning is that by including all African cultures and their visual culture in African art, the general public will gain a greater understanding of the continent's cultural diversity. Recognizing that there was often a confluence of traditional African, Islamic, and Mediterranean cultures, scholars have concluded that drawing distinct divisions among Islam, ancient Egypt, the Mediterranean, and traditional African societies makes little sense. Arts of the peoples of the African diaspora prevalent in Brazil, the Caribbean, and the southeastern United States, are now included in the study of African art as products of the African diaspora. Museums in the U.S. With African Art Collections. www.sil.si.edu. African Art: Aesthetics and Meaning. www.lib.virginia.edu. This page was last modified on 5 February 2019, at 17:41.